Dec 12, 2016: What PC Speakers should I get? Dec 18, 2016: [Peripherals] Good speakers, ~$100? Feb 12, 2017: Speaker Recommendation Help! Apr 09, 2017: Fiio K5+Sanskrit6+Speaker? Apr 22, 2017: My new speakers sound so bad while Gaming. Jun 08, 2017: Speakers for PC? Jul 04, 2017: Should I first invest in a nice pair of headphones or studio monitors for mixing? Aug 10, 2017: What's the best size/performance setup I can get with a remote for my TV. Oct 27, 2017: Can someone please help me with this? Dec 06, 2017: Is there any way to add a subwoofer or more speakers to these? Dec 11, 2017: Looking for a good pair of speakers that are &gt;$100 to power a turntable. Got an Audio-Technica LP120 and a TubeMagic DAQ/AMP for headphones. 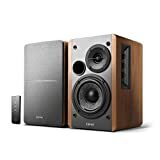 Jan 31, 2018: Bookshelf speakers or Razer Nommos? Mar 03, 2018: Oops, wrong connections. What are my best ~$100 options to pair with the Polk Audio PSW10 subwoofer? Apr 02, 2018: Been working towards this point for a while - it’s great to finally have it complete! Apr 19, 2018: Please recommend speakers to upgrade my Amazon Echo listening experience. Budget $150. Jun 17, 2018: Help for a newbie? Jul 18, 2018: Does anyone have any experience with these monitors? Aug 07, 2018: Recommendation for speakers for TV under $100. Oct 02, 2018: What entry level studio monitors should I buy? Nov 20, 2018: is it possible to connect these speakers to an amplifier? Dec 06, 2018: Just purchased the PreSonus Eris E3.5 - for $75, is there a better one at this price point? Dec 26, 2018: Limitations/capabilities of my current speakers? Jan 18, 2019: Volume control on three levels, plus EQ?